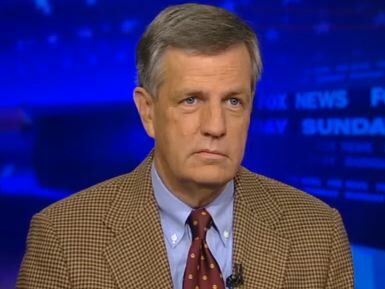 Brit Hume: Case For Hillary Clinton "Being A Great Secretary Of State Is Exceedingly Weak"
WALLACE: Yeah, I want to pick up on that, Brit, because during the hearing, what struck me was the Republicans were tough on Hillary, on Benghazi and the Democrats weren't. But, both sides kept on saying what a great secretary of state she had been and to praise her service. And here's some of the points that have been brought up, some of her accomplishments. She helped assemble the bombing campaign in Libya to topple Muammar Qaddafi. She helped assembly the coalition that imposed the toughest sanctions ever on Iran. And, she established diplomatic ties with Burma. Question, Brit, how do you rate Hillary Clinton's performance, record as our top diplomat? HUME: I think those examples you cited would add up to a case for her competence. They do not add up to a case for greatness, after all, the groundwork on Burma had been done by the previous administration. And the administration properly followed through on it. You look across the world, now at the major issues. Are Arabs and Israelis closer to peace? How about Iran and North Korea and their nuclear programs? Have they been halted or seriously set back? Has the reset with Russia, which she so famously introduced with the photo-op in Moscow with the reset button, has they lead to a new and more cooperative relationship? Is there a Clinton doctrine that we can identify that she has articulated and formed as secretary of state? Are there major treaties that she has undertaken and negotiated through to a successful conclusion? I think the answer to all those questions is that she has not. And those are the kinds of things that might mark her as a great secretary of state. She has certainly been industrious. She has visited 112 countries. Her conduct as secretary of state has been highly dignified. She does her homework. There have been no gaffes or blunders. So I think she has been a capable and hard working secretary of state, but I think the case for her being a great secretary of state is exceedingly weak. Bill Maher Rips Takers: "There Are A Lot Of Dirtbags In This Country"
Krauthammer On 40th March For Life: "They'll Be Out There Marching For Another 40 Years"
Carney: Court Ruling On NLRB Appointments "Novel And Unprecedented"